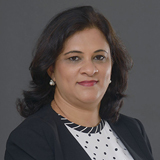 Dr. Ritu Manchanda M.D. (HOM) is a Senior Homeopathic Doctor with a rich and diversified experience of over 18 years. She is an alumnus of the prestigious Nehru Homeopathic Medical College and Hospital, New Delhi, India. She graduated with a Bachelor Degree of Homeopathic Medicine and Surgery in 1998 followed by M.D (HOM) from Punjab, India. She worked for renowned hospitals like Sir Ganga Ram Hospital, Indian Spinal injuries, New Delhi, India along with her own clinical practice. Since last 9 years, she lives and practices in Dubai and handles both acute and chronic health conditions from paediatrics to geriatrics. She is also an expert for preventive homeopathic medicines to build up the immunity against common childhood diseases. She practices classical Homeopathy and prescribes purely homeopathic remedies. Areas of Expertise: Respiratory - Sinusitis, Allergic rhinitis, Common viral infections, Paediatrics, Joint disorders/Arthritis, Gastrointestinal-Acidity, IBS, Ulcerative Colitis, Gynaecological disorders, Migraines, Skin-Seborrhoeic dermatitis, Allergic dermatitis, Psoriasis, Eczema, Skin allergies, OCD, Anxiety disorders, Stress disorders.